Simple and reliable gear. These mitts are exactly what you need to get your hands nice. No unnecessary straps or loops, the Seven focus mitts slip right on... and stay on. They stay put in the proper position thanks to the anatomically designed foam half-circle that's placed in the interior compartment. The interior grip gives you great control over the mitts during sparring, while the curved leather striking surface guides strikes to the center "sweet spot" of the padding. 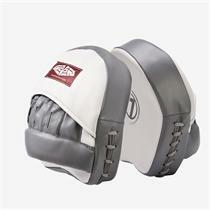 Overall a great go-to pair of focus mitts that stay cool thanks to a ventilated hand compartment. Email your friend about the Seven Fightgear Focus Mitts. Ask a question about the Seven Fightgear Focus Mitts.